For Carl Theriault of Fort Kent, community service is a way of life, and retirement lets him enjoy it all the more. FORT KENT, Maine — For Carl Theriault of Fort Kent, community service is a way of life, and retirement lets him enjoy it all the more. The Greater Fort Kent Area Chamber of Commerce named him their Citizen of the Year in 2000, and 18 years later, he continues to serve others. Theriault, 62, was born in Massachusetts to parents Lucien Theriault and Marie Audibert Theriault, both Fort Kent natives who had left the St. John Valley when Lucien took a job as as an engineer for General Electric. “Dad is from a potato farm in Wallagrass and mom from Audibert Street in Fort Kent, so this is home,” Carl Theriault said of Fort Kent. He met his wife of 40 years, Pat Theriault, while both were students at the University of Montana. Carl ultimately earned three degrees: an associate’s degree in electromechanical technology, a bachelor’s in business administration and a master’s in international business management. The couple initially raised their sons Jean Luc, now 37, and Joseph, 32, in Seattle and Germany, where Carl worked for the radiological equipment manufacturer Picker International. While in Frankfurt, they decided they wanted to bring their children up in a more closely knit community. The family returned to the Valley in 1995, following Carl’s parents, Lucien and Marie, who had come back two years earlier. The Theriaults purchased a car dealership in Fort Kent, Valley Auto, which they operated until it was destroyed by fire in 2002. At that time, they sold the business to Steve Pelletier, who renamed it Valley Motors, and the Theriaults began enjoying retirement. 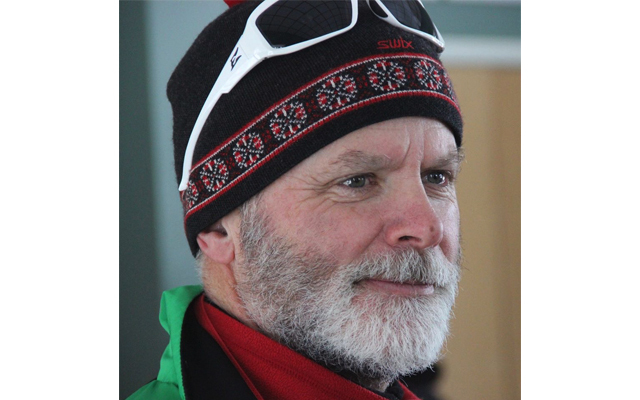 In 1998, Theriault became a founding trustee of the Maine Winter Sports Center, and later became a founding member of the Fort Kent Outdoor Center in 2014. He also began coaching Nordic skiing at Valley Rivers Middle School/Fort Kent Community High School, and over the past 20 years he has also variously coached Alpine skiing, biathlon, soccer, Little League baseball and tennis. “Since I sold the business this has been a bigger part of our life,” Theriault said of local volunteer activities. He also volunteers as the coach for the Jalbert Youth Ski Program at the Fort Kent Outdoor Center. “I get satisfaction out of watching them develop their goals. It feels good to watch kids achieve,” he said of coaching youth sports. Theriault has as a board member or trustee for Lonesome Pines Trails, Maine Winter Sports Center, Fort Kent Outdoor Center, State Board of Education, UMFK Board of Visitors, BikeMaine, numerous ski events, including two Biathlon World Cups and the Paralympic World Championships. He remains close to his parents. Lucien now 92, has volunteered for the past 25 years at both Lonesome Pine Trails and the Fort Kent Outdoor Center on a variety of projects, from mowing lawns to maintenance and repairs. Carl takes after his father’s active nature. “I don’t like sitting still,” he said. Carl and Pat live in a home adjacent to the Lonesome Pines Ski Resort with their dog Mandy, two horses, 10 chickens and two cats. Carl is president of the FKOC and Pat is treasurer. Last December, Theriault helped raise funds for an athlete on his Nordic ski team, Patrick Parham, then a 15-year-old fighting cancer. This summer, Theriault accepted an appointment as a community member to the Northern Maine Medical Center Performance Improvement Committee. In their free time, Carl and Pat enjoy traveling. Last July, they visited Dubois, Wyoming, where they herded 600 cows from winter to summer pasture on horseback. Raised on a farm in Glendive, Montana, his wife enjoys those activities. “She was brought up with lots of cows,” he said. The couple has traveled to ride horseback in many countries, including Argentina, New Zealand, Italy, Croatia, Russia, Germany and Iceland. “We enjoy riding horses in different areas of the world; it’s a great way to experience rural areas,” Carl said. However, they are always happy to return to Fort Kent following their adventures. “This is home and we love it,” Carl said.